Guys, Christmas is coming. And with it? Financial ruin. Okay, forgive me for being a little dramatic here. But if you're anything like me, you'll really be feeling the pinch at this most festive time of the year. So today, I'm sharing some festive, money-saving tips and tricks to help you keep your bank balance in the black! Get all your gift cards and gift wrap in the January sales. You'll find huge discounts on festive items, gift cards and gift wrap included, in the January sales. Just make sure you keep everything you buy in the January sales in a safe place; otherwise you'll be unable to find it again come next Christmas! Keep a gift drawer. You're going to need a safe space to store all the reduced price festive wrap and gift cards you picked up in the January sales. You can also add to this gift drawer throughout the year, picking up gifts whenever you see them, thus spreading the cost! Take advantage of the Black Friday sales. Speaking of sales... You can find some great reductions on so many products in the Black Friday sales that you're bound to be able to pick up at least a few of your Christmas presents during these sales. Keep an eye on Amazon, especially! And remember, Black Friday sales don't end on Friday. They carry on well into December, so there are plenty of savings to be had! Consider sending E-cards. I receive a few lovely E-cards every year, and always enjoy them just as much as I do physical cards! DIY it! If you have any skills, put them to good use when it comes to gift giving. Whether it's a gorgeous painting, a framed photo (you can buy lovely, and inexpensive, photo frames from Wilko/B&M/etc) or your services as a babysitter. Whatever skill or service you could offer a loved one, they're sure to appreciate it! Put a limit on gift-giving. If you're at that age where all of your friends have kids, then consider only giving gifts to the kids. Their parents will appreciate it so much more. And isn't Christmas really all about the kids? Re-gifting. Controversial though it may be, I'm a firm fan of re-gifting. Only in the right conditions, though, of course. Re-gifting an old gift set that you've never even opened? Totally okay (but dust off any cat hairs that may have found their way onto the packaging first!) Re-gifting a half-empty bottle of bubble bath? Definitely not okay. Sometimes you receive some lovely presents that you'll just never use, and why should they just go to waste in your house before you dump them in the bin? Put money aside all year round. It doesn't have to be a lot, but even £20 put into a separate savings account every month can really add up! As we get closer to Christmas, I put all of my blogging income in a savings account and use it for Christmas shopping. It means my wages take less of a hit, so I can still pay the bills. Alternative wrapping solutions. 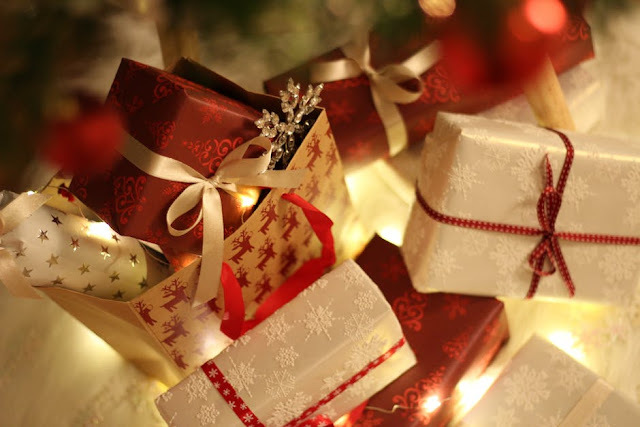 If you weren't quick enough to get your wrapping paper in the January sales, you might be balking at how much it's going to cost to wrap all your Christmas presents. Why not try re-purposing brown craft paper, empty crisp packets (turned inside out, washed and dried), maps etc. Much cheaper, and more environmentally friendly! Remember, it's the thought that counts. There's a tendency, even in myself, to try to match what you think others might have spent on you. And that's just not necessary. It really is the thought that counts, so think less about how much you're spending and more about what you're buying. How do you save money at Christmas?